I worked for the Pittsburgh Public Schools for a LONG time and periodically in the winter school would be delayed or cancelled because of huge snow storms that dumped white stuff and ice on the city making it dangerous for school buses (and cars, of course) to get around. Well, this week we have had the Cameroonian equivalent twice – torrential rain. With tropical rains, often the skies open and dump buckets of rain in a short amount of time (as I noted in my blog two weeks ago). Still, usually for an hour or so it rains really hard and then tappers off to a milder rain. Not this week! On both Monday and Thursday, the rains started just after dawn – between 6:30 and 7 – and continued – hard – until 10 or 10:30. A LOT of rain can fall in that amount of time! Near my porch where the water comes off the roof, there are often long puddles when it rains – naturally. This week, we had puddles and lakes everywhere! And where there wasn't a lake, the grass was like a swamp. It fascinates me so I tried to get some during and after pictures. Did you every try to take pictures of the rain? It doesn't show up as well as snow does! The after pictures are about 1 ½ hours after the rain stopped. Already much of the water was soaking into the ground but the grass was still swampy and the mud lasts a lot longer. Last night a second tree fell over. This one had been located in one of the temporary lakes. (The other fell last week near Dr. Solofo's house.) The root systems were just not able to keep them upright in the saturated soil. Another funny weather story. The people at Yazeka School called the Village School Program because there was a problem with the latrine. I got the initial story third hand it wasn’t clear if lightning struck it, it imploded or exploded. I saw Mathias today. He said it was a latrine with a metal roof. It was struck by lightning and the walls cracked. No one was hurt; it can be repaired; and it is still usable. The Parent Organization was concerned that the VSP would remove the school because the latrine was stuck by lightning. Many people believe that many lightning strikes hit where they do because of witchcraft. The leadership team of the VSP did not believe that cause and assured people in Yazeka that the school would stay where it is! After all, the metal roof probably attracted the lightning as the school is outside of town. The school itself has a thatched roof. Just like on a snow day, people who can stay inside do. One would be soaked to the skin in about five seconds. Everyone knows that activities are put on hold. I, of course, didn’t go into town, but shop owners report that they don’t open at the usual time either. Why bother when next to no one would come? So what did I do with my “snow days”? I could do much of my work since it is inside with a computer (and the electricity and internet continued to work). There were no people scheduled to come to work with me so that wasn't affected either. (Note: the border is open and things have continued to be calm, but crossing the border takes much longer than usual. Also, many of the people I work with have had other meetings or visits to churches/schools.) Still, unexpected time deserves work on unplanned projects (in addition to regular ones). Monday I made bread pudding. While I was in the US this summer, a new fancier bakery opened in Garoua Boulai. I went in a while ago to check it out and was impressed with the variety of baked good offered, including whole wheat bread. I bought some. When I got home, I discovered it was so stale that it was inedible. Sad. I froze it thinking that it might work better when I took it out, but that didn't work either. So, bread pudding. I had made some a couple of times at Mom’s house while I was there. It actually tasted good (although in my opinion it was missing something – besides raisins which one can find in Yaoundé but not GB). But, when I tried to print a copy I had trouble getting it onto less than 3-4 pages. Not what I wanted. So, having (or taking) some extra time, I decided to create my own map in Power Point so it would be one page. I tried Google Maps, but they label very few towns in westerns CAR. Mapquest was better – not all the towns I wanted, but lots of them. It’s a balancing act, though. You have to zoom in far enough to be able to see the town names. Then there was a lot of cutting and pasting because at that level, you can’t get a wide enough area. And, the map still can’t be too big to fit on the page. I succeeded, but the names of the towns are tiny. Oh, well. I numbered the towns/schools. In all cases but one the name of the school is the same as the name of the town. 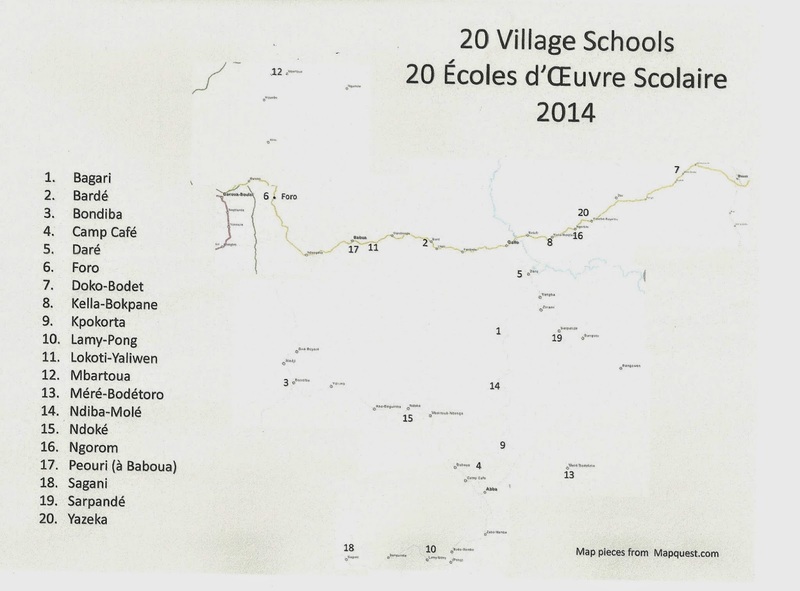 (The school in Baboua is called Peouri.) Now,I have a pdf version of the map which I will send/post when I send this blog. By the way, thanks go to Joe Troester who found me the latitude/longitude coordinates for many of the towns more than a year and a half ago. Thanks also to David Zodo, curriculum supervisor of the Village School Program who sat with me and a map to locate the schools that didn’t show up correctly with the coordinates. I am happy to have the maps done. I went to town yesterday to see if I could copy the one-page map to give to my colleagues. I knew that the town names were small and not very distinct, but he adjusted the darkness and created good copies. Many thanks abound! The US is heading into winter. If you get a snow day, may it be a productive and enjoyable as mine have been!